Banana Bread | eat. write. smile. 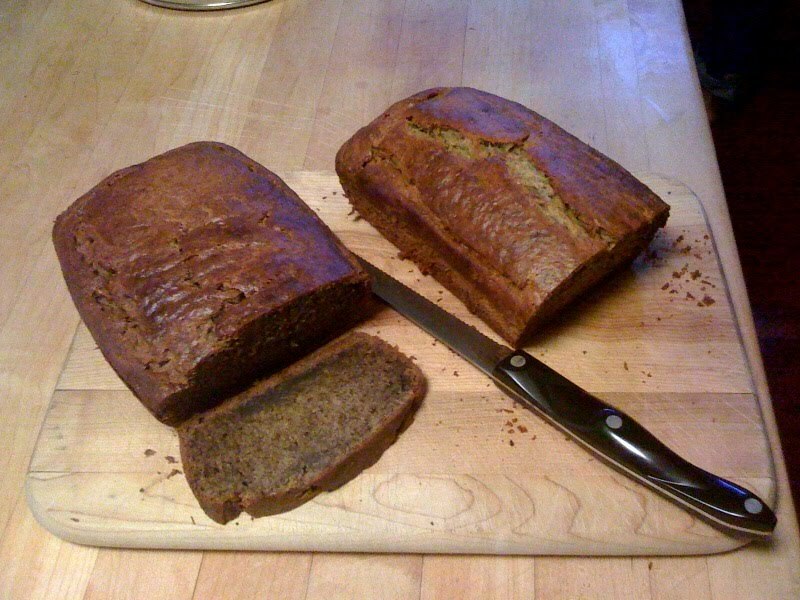 As the old saying goes: When life gives you overripe, mushy, brown bananas, make banana bread. I came home to my parents’ house on Wednesday and started poking around the kitchen, as I always do. In the freezer, I found two bunches of frozen, overripe bananas, just begging for someone to make banana bread. I decided to take advantage of the opportunity to side-by-side test two recipe variations. I love regular banana bread, but from my childhood I vividly remember enjoying my Tita Bea’s recipe that includes coffee grounds for crunch and an unexpected flavor punch. For some reason, I’m not wild about nuts in my banana bread. Just doesn’t do it for me. 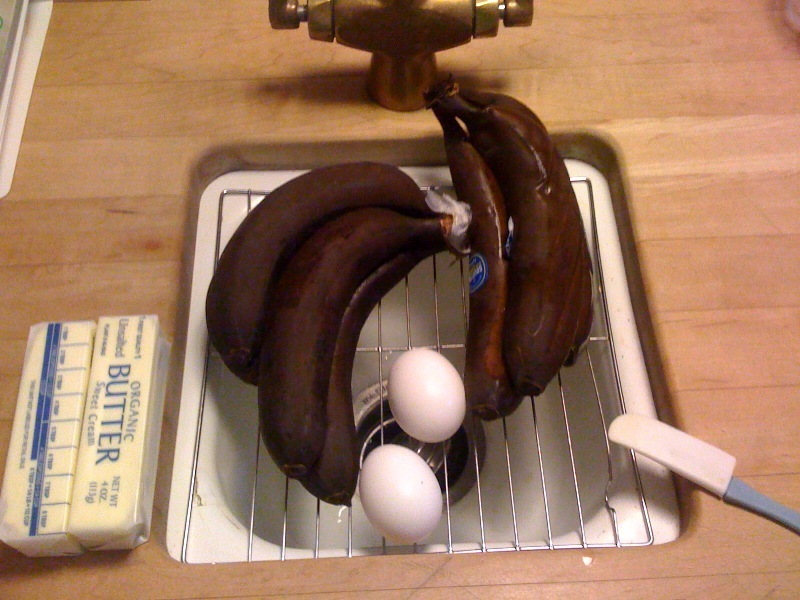 Mix bananas and butter together, then add sugar, egg, and vanilla. Sift flour, baking soda, and salt (and coffee, if using) and add to banana mixture. Pour into a bread loaf pan, and bake for one hour at 350 degrees F. When the top is browned, and firm but spongy to the touch, it’s done. 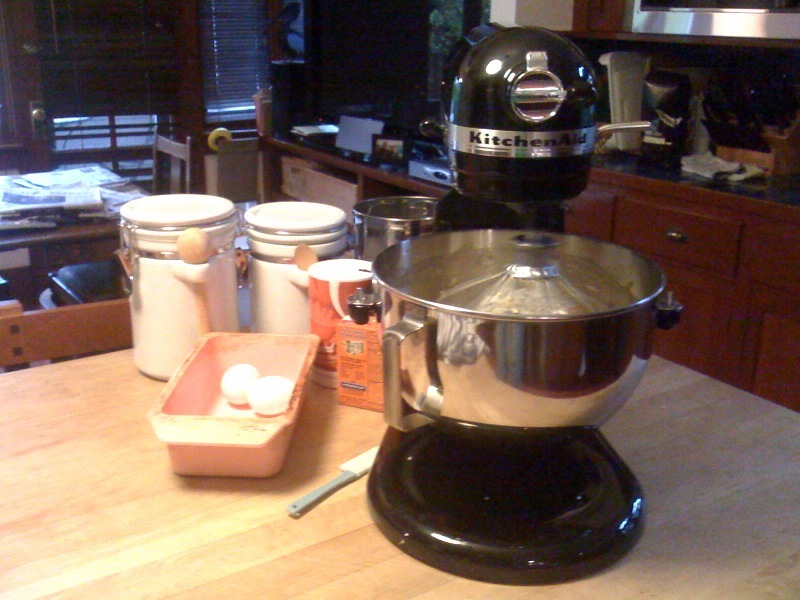 Here is a shot of my Christmas present at work, the Kitchenaid Countertop Professional 6 quart mixer. SO PIMP! Thanks Mom and Ben! The smell alone of banana bread in the oven should be reason enough to try this recipe. Our kitchen smelled like a warm, inviting tea house, which was the perfect contrast to the pouring rain outside. I also used this side-by-side test to try out two types of bread pans. I have a glass pan and a flexible silicone pan that can be pulled away from a loaf. I had been wondering which one would work best, as banana bread sometimes sticks to the bottom and break off in chunks as the finished loaf is removed. I think the plain banana bread is the best. The loaf with the coffee grounds was delicious, but it was almost too much new flavor, the banana-ness of the loaf was obscured. 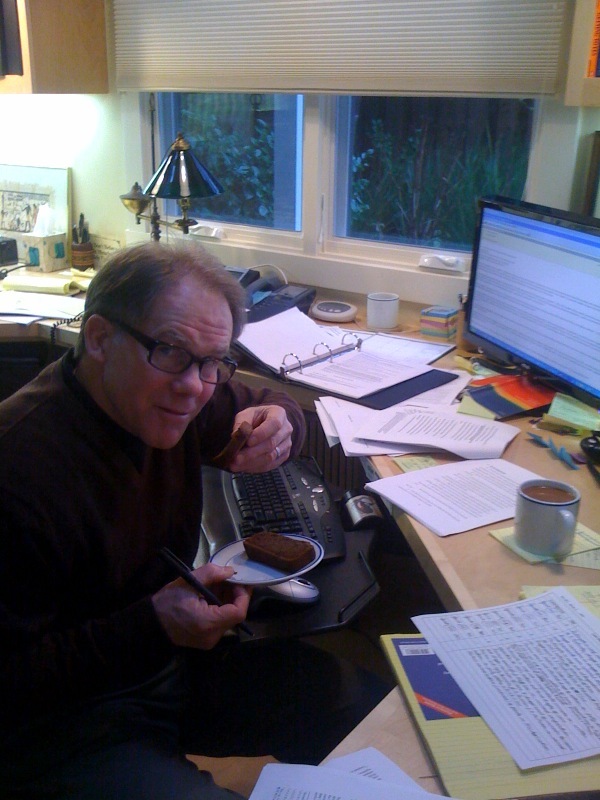 Though the coffee addition was an interesting tweak to a favorite, I preferred the plain banana bread. Perhaps my parents- even more coffee addicts than I am- liked the coffee loaf; they didn’t say one way or the other. As for the pans, the glass pan did not mangle the banana bread, primarily because it was properly greased with butter (sorry for loving butter). 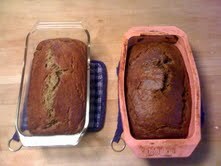 The silicone pan, while very convenient, easy to use, and novel in color (hot pink), didn’t hold the shape of the loaf. I ended up with a fat cousin of the regular banana bread, because the weight of the dough pushed the flexible sides of the pan outward. Aesthetically, the glass pan produces a better loaf. Call me superficial, but looks matter! And the difference in loaf removal is negligible. Moral of the story: if it ain’t broke, don’t fix it. Classic banana bread is delicious, and glass baking pans work just fine. You know you have some brown bananas lying around, so bake yourself a loaf, make yourself a cup of coffee like my Papa here, and enjoy a warm slice spread with- you guessed it- butter. 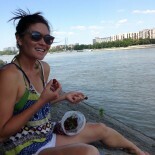 This entry was posted on January 23, 2010 by Ruthie in Uncategorized.